Fluorscence optical tomography is an emerging imaging technology for pre-clinical applications. The method exploits the ability of so called fluorophores to absorb light and re-emit it at a longer wavelength. Many of these dyes have optical properties (e.g. the fluorescent life-time or the quantum yield) which are sensitive to the biological surrounding. 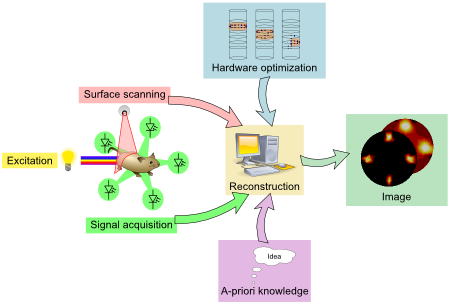 Thus, fluorescence tomography is capable of functional imaging, i.e. it is possible to image metabolical states and functional processes. First a fluorophore is injected into the animal. Then the tissue is illuminated by a set of light sources. These can be placed on the tissue's surface directly or free-space arrangements are used which utilize laser beams, for example. The excitation light will penetrate the tissue where it is scattered and absorbed. A part of the light which is absorbed by the fluorophore is re-emitted at a shifted (longer) wavelength. Finally, the emitted light is recorded when it reaches the surface of the sample. Using mathematical models it is possible to compute the distribution of the fluorophore from the knowleged of the light-sources and the boundary measurements. The forward model describes the distribution of photons inside the tissue. The inverse problem seeks to reconstruct the fluorophore parameters, especially the concentration and the life-time, from the boundary measurements. However, this inverse problem is underdetermined and ill-posed which leads to an amplification of measurement noise. Therefore, the reconstruction is stabilized by incorporation a-priori information into the algorithms. Nonlinear reconstruction schemes together with non-quadratic regularization strategies have been subject to investigation. Here you can find a list of related publications. The fluorescence tomography hardware developed at the Institute of Medical Engineering is steered over USB whenever possible. Here you can find the sources and description for a Microchip PIC containing a USB stack.